They were visionaries and dreamers, if not downright crazy. When the Sand Nativity started in Jesolo, some people would not have bet a ha’penny on the experience. It faced indifference, scepticism and even ridicule. It required the tenacity of the visionary and dreamer Massimo Ambrosini, Director of the Tourism Office at the Municipality of Jesolo, who believed in the soundness of the proposal with great foresight. That was in 2002. Sixteen years later, the Sand Nativity and Jesolo are now inextricably linked. Thousands of people visit it every year. And thousands of people, even with no entrance fee, have participated by freely contributing to charitable projects that have brought the name of Jesolo, or rather its heart and generosity, to several parts of the world. Year by year, the appeal of the Sand Nativity has been growing. The expressive power of the sculptures and the capacity to find a different interpretative theme each year has not only dispelled doubts and scepticism but has also created space for an even more daring dream: to bring the sand nativity scene to San Peter’s Square. I had the fortune to be the first person to embrace that dream. 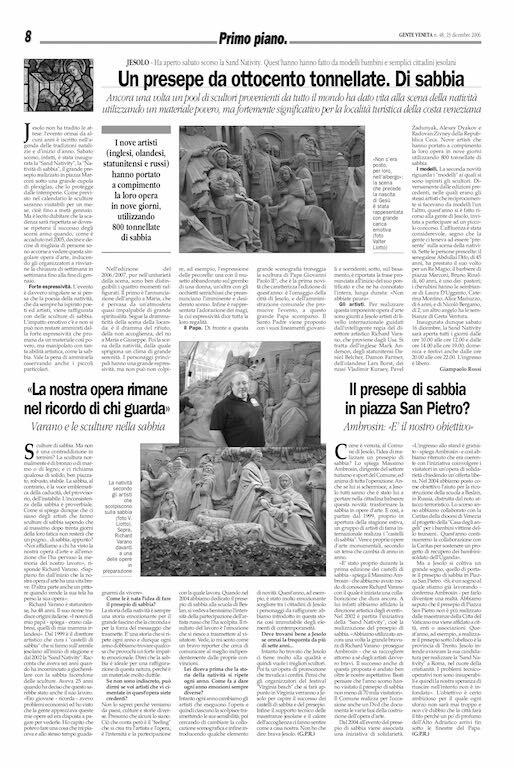 Gente Veneta, the newspaper of the Patriarchate of Venice, decided to devote an entire page to this event. That was in 2006, when the growing success of the initiative deserved closer attention. To organize the page, I arranged a chat with Massimo Ambrosin and Richard Varano, the artistic director of the event. I remember looking him right in the eye, as if to say: have I understood you correctly? “Yes, it’s a dream that we’ve been thinking about,” was his answer. I did not hesitate to make that dream my own. However, when it came to writing the article for the newspaper, I had a few doubts. Could this dream be published in print? Might it not be an act of presumption, if not downright arrogance? We were the newspaper of the diocese, so perhaps a bit of caution might be necessary. However, I only had to think of those large sculptures to overcome any hesitation. That nativity scene, made in that way, speaks of the mystery of the Incarnation to people of all sensitivities, believers and non-believers. The page appeared in the 23 December 2006 issue of Gente Veneta. 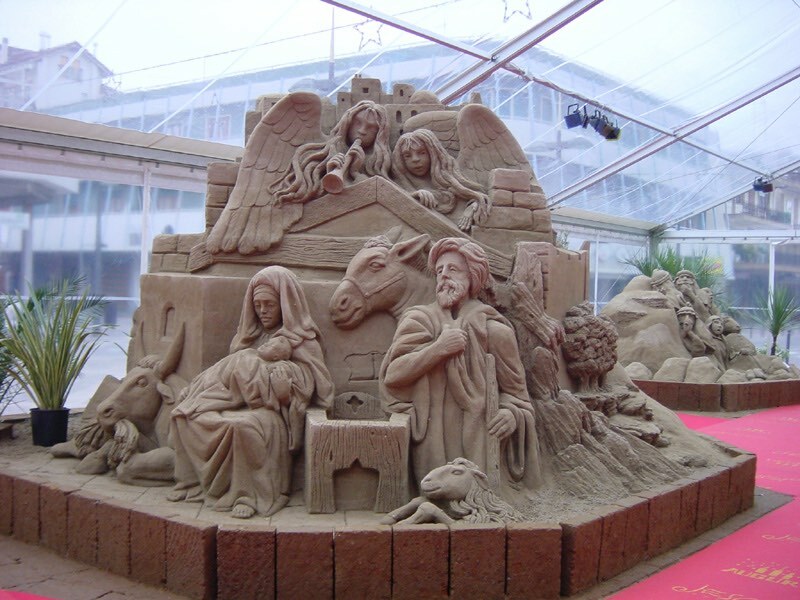 One of the three articles was entitled “The Sand Nativity in St. Peter’s Square?”. The question mark was a remnant of the editor-in-chief’s prudence. For the first time, Gente Veneta suggested the possibility of “a touch of fragrance from the Upper Adriatic arriving beneath the Pope’s windows”.Il presepio di sabbia a Piazza San Pietro?”. Il punto di domanda era il residuo di prudenza del caporedattore. Per la prima volta Gente Veneta avanzò l’ipotesi che “un po’ di profumo dell’Alto Adriatico arrivasse fin sotto le finestre del Papa”. Jesolo waited for 12 years. Now that Adriatic fragrance will truly waft through Bernini’s Colonnade.